Every once in a while, the father of Meliora K has the house to himself. It’s lonely and much too quiet, but a #bachelorweek every now and again isn’t such a bad thing. It seemed like a great occasion to pass along 2 great pieces of pizza-related information you can use at home – with or without the entire family. Order big – and in bulk! Everyone loves Costco and Sam’s Club, but this can apply to pizza delivery, too (remember, #bachelorweek is in full effect). 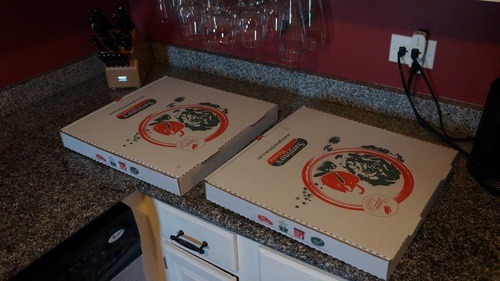 Our friends at NPR had this great tip earlier this winter: Buy the big pizza. It almost always costs less per slice than its little brothers and sisters. You can always take what you don’t finish and put it in the fridge for later. BOGO Extra-Large? Now THAT’S a value! Now, what to do when you can’t finish all that tasty pizza? 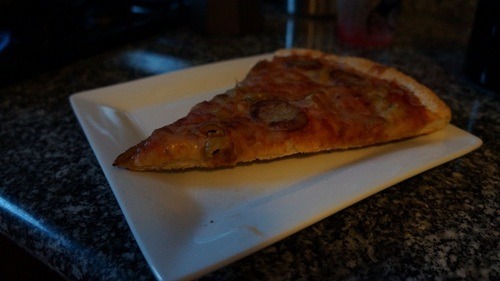 I do love cold pizza for breakfast, but when I get home for dinner, HOT pizza’s where it’s at. Seeing as it’s #bachelorweek, there’s going to be many consecutive meals of nothing but pizza. This means I need a quick, efficient way to heat up a slice or two. If you’re used to waiting for an oven to preheat AND 12-15 minutes to reheat pizza (that’s at least 30 minutes, or 12 hours in hunger time) I’ve got a treat for you! I ran today, I can have another slice. A crunchy slice, not a droopy one. 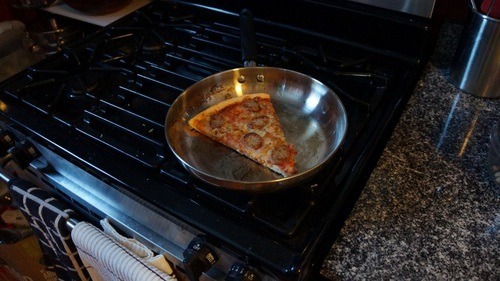 STEP 1: Take that cold, floppy breakfast pizza and put it into a pan (or on a stovetop griddle if you’ve got one). STEP 2: Put the head on medium-low. If you want to speed it up a little, put a cover over the pan. 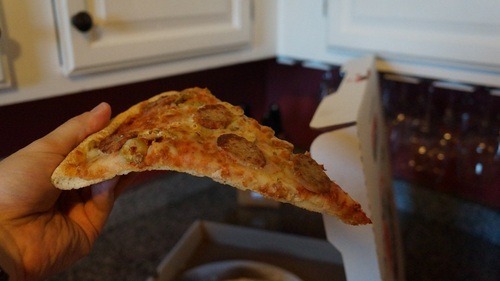 Careful not to put the heat on too high or you’ll burn the crust before the cheese and toppings warm up. No one wants that. Remember, handle in for safety! I mean, look at it – it’s so crispy it won’t even bend to the shape of the plate!!! It’s like a bridge from hunger to happiness! STEP 4: Eat, savor, enjoy. You’re eating before the oven would be finished preheating, AND you’ve saved all that energy it takes to preheat, too. You’ve saved time, energy AND money. Spend it on a good beer or other beverage of your choice (again, #bachelorweek).